The state kitchen towel collection is the one that started it all for Vestiges. Each towel features one state represented by bright colors, unique state facts, and fun trivia to highlight each state's notable characteristics and contributions to our great country. The designs are bold, bright, and modern, ensuring they will look great in any kitchen. I bought these as gifts and all the recipients liked the details about their state. These are the biggest tea towels I've ever seen. Large and good quality cloth. Design as pictured on the website. Included all relevant items about Montana. Arrived quickly. I bought this for someone new to Vermont. They loved it! 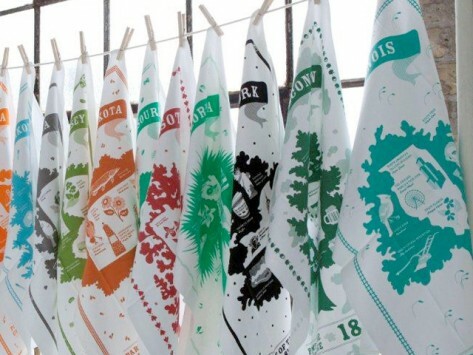 The collectible towels that Mary Lazarus and Lucy Pellizzer have created are more than ordinary kitchen towels. The inspiration for Vestiges came while Lucy was teaching Mary Italian. They realized they shared a passion for heritage, travel, and an appreciation for collectibles. They wanted to bring back an old 1930's American tradition of collecting souvenir textiles of places and landmarks that had been visited. Students at the Minnesota College of Art and Design are creating updated designs and landmarks for all 50 states as well some regional and limited edition towels. Vestiges towels are made of 100% preshrunk cotton and use water based inks. Not only are these colorful towels perfect for the kitchen or bar but are frameable, making them an affordable and unique piece of art for any decor.